Before bidding goodbye to October and saying hello to November. 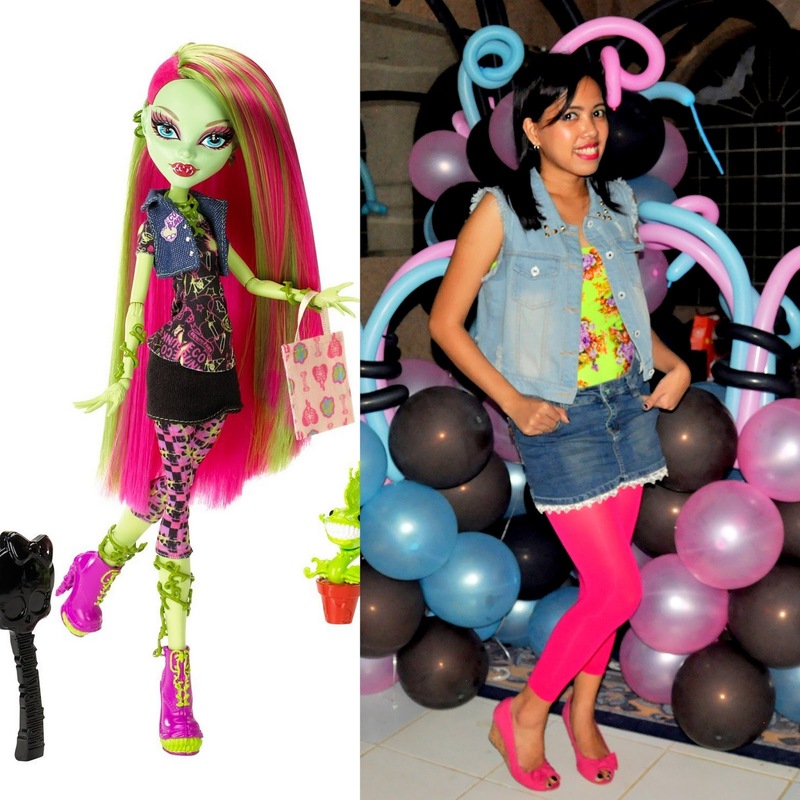 Will be sharing an outfit inspired from the Monster High character. This isn't actually a latest outfit, its one of those forgotten one... However, I am so glad to find the perfect time to share this to you. Wore this outfit at my niece Monster High theme birthday party. I am loyal to my real name so I choose to dress up like Venus Flytrap. I have so many plans on my look but ended not wearing any accessories and didn't even complete my make-up because I was so busy with the party details. I worked on the decorations of the party and also help the birthday girl's friends on their costume. I also did all the kids make-up. I am glad I was able to have few solo photos though... I never thought I could. Watch out soon on the blog, will also share the kids Monster High outfits. What do you think of my Venus Flytrap outfit? This is such a sweet costume idea, I'd have never though of anything like this - I tend to just dress up as a cat as often as possible haha! ;) Happy Halloween! I love your outfit, very creative and cute. Happy Halloween! This is so cute venus. You look so cute! And exactly like Venus! love how fun this is! Your outfit, which was inspired by Venus is amazing! This is too cute! You totally pulled this look together! You're in the philippines right? I didn't know that they actually dress up there now. Fab look for a Monster High-inspired party! super cute costume idea! colors look great on you! This costume idea is so cute! They're always cool! You looked very cute! Such a fun color combination for Halloween, Venus! Love how you styled denim here. This is so cool! Great colors!! Spot on!! Love it! Happy Halloween!! Such a cute and different idea! You look fantastic! Love the pink shoes and leggings on you!! What a cute and fun costume. You look beautiful! This is so cool - theme birthday parties are the funniest ones! You totally nailed the Venus Flytrap look :) Can't wait to see the kids' outfits! Cool outfit choice for the theme!! So cute! Loving the denim! Girl, you are such a GODDESS. Love this look on you.